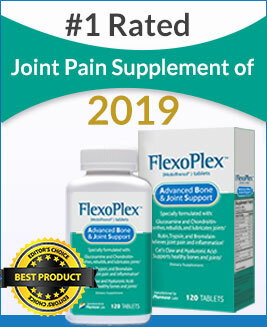 The best joint pain supplements for 2019 to deal with achy joints and inflammation. Which Joint Pain Supplements Really Work? But despite its high prevalence, treatment for arthritis is limited to relieving the symptoms such as Osteoarthritis and inflammation without directly addressing the disease. This is exactly why a lot of people turn to alternative remedies such as joint pain supplements in order to find some relief. In order to manage the joint pain, relieves any kind of discomfort, and improve flexibility people usually opt for the best joint pain supplement. How to Choose the Best Joint Pain Supplements? 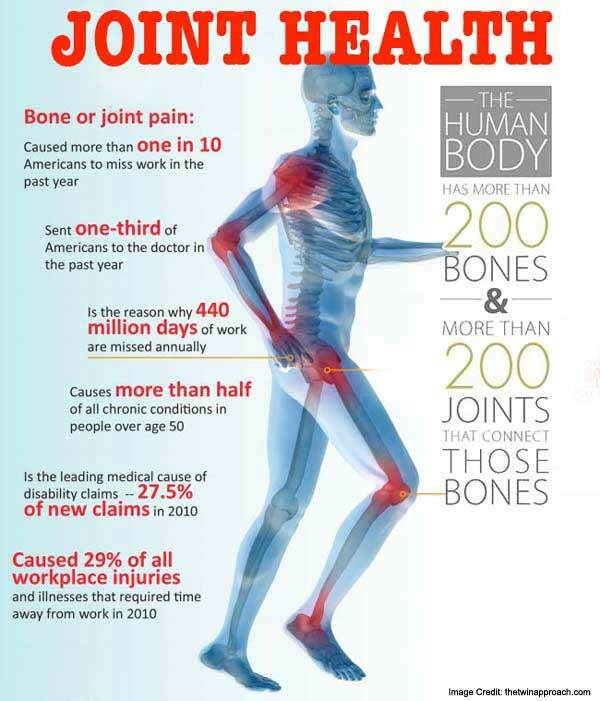 Joints are vital parts of the human body that are needed for adequate movement. When joints hurt, a large number of issues may be contributing to the symptoms experienced. In addition to pain, other symptoms like tenderness, stiffness and swelling may also be present. WebMD explains that the cause of painful joints can vary from simple injuries to more serious health conditions, such as osteoarthritis, bursitis, rheumatoid arthritis and gout. Even though rare, it should be noted that cancer within the joints can also cause such symptoms to become present. Choosing joint pain supplements is not easy. This is mostly because there is an abundance of joint pain supplements on the market with most of them not offering any true measurable benefits. Because most of these products are designed as dietary supplements, they don’t undergo vigorous FDA testing making their ingredient safety and efficiency highly debatable. Furthermore, the studies on common ingredients in joint pain supplements are inconclusive and contradictory as stated in a review on joint pain supplements published in Pharmacy and Therapeutics. So choosing the best joint pain supplements will largely depend on your own research and trust regarding these products. Considering ingredients quality and efficiency, label transparency, product reviews, we’ve picked out 10 of the best joint pain supplements in terms of safety and efficiency. 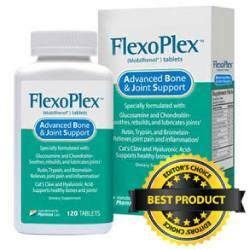 Flexoplex is a supplement designed to address all issues that could be affecting arthritic joints. The product claims are that it can repair joint cartilage, improve joint lubrication, reduce inflammation, decrease pain and lead to better joint mobility. The ingredients in this product are chondroitin sulfate which, according to clinical trials, is the best form of chondroitin for OA. The product also contains glucosamine sulfate, Boswellia, hyaluronic acid, rutin, MSM, trypsin, and bromelain. While chondroitin and glucosamine work to repair the structure of joint cartilage, ingredients such as bromelain reduce pain and inflammation caused by osteoarthritis. Bromelain, which is a pineapple extract, has been extensively studied – this natural substance is considered a safer alternative to NSAIDs in the treatment of arthritis pain. The manufacturers of Flexoplex offer a 60-day money-back guarantee. In case you find the product ineffective, you could just return the bottle and get your money back. Flexoplex can be ordered directly from the product’s official website, and different packages are offered to meet the needs and budget of every particular customer. Read more about Flexoplex here. Turmeric curcumin plus is a superfood designed to help people with little or no time in paying attention to their diet or lifestyle stay in shape both in mind and body. The product contains a potent ingredient called turmeric, which has a long history in ancient remedies for its antioxidant and anti-inflammatory properties. Turmeric curcumin plus features a unique blend of natural ingredients, which helps users relieve joint pain, increase cognitive performance, foster brain health and anti-inflammatory response. Also, it may be a great support to achieving your weight loss goal, as it has antioxidant properties to help boost your body metabolism. However, individuals may experience different results with the supplement. 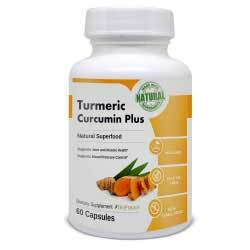 Read more about Turmeric Curcumin Plus here. Projoint Plus is a dietary product, which is basically formulated to assist with alleviating pain in your joints. This supplement contains a potent dose of ingredients that have been scientifically proven to provide a relieve in the symptoms experienced following an injury, as well as caused by arthritis. Age-related deterioration, which is usually caused by wear-and-tear over the years, can also have a significant impact on a person’s life. This supplement will also assist with reducing the symptoms caused by these problems. The supplement is in the form of a capsule that can be taken with or without a meal. It also contains ingredients that assist with the delivery of the active ingredients into the bloodstream; thus providing faster results. This product can be purchased from the official website at $29.95 for a packet of sixty pills. This formula also offered on a 60-day money back guarantee. There is a lack of information regarding the manufacturers of Projoint Plus, and specific dosage instructions are also not provided on the page that describes the benefits of the product. With sixty capsules found in each container, however, the user would most likely be required to take two capsules daily – more accurate dosage instructions can be found on the product’s label. 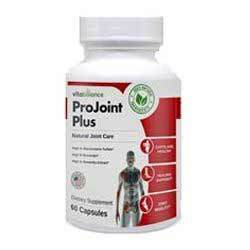 Read more about Projoint Plus here. 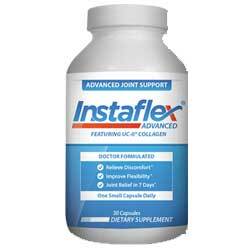 Endorsed by famous football player Doug Flutie, Instaflex is bound to offer at least some benefits to arthritis sufferers. Unlike most joint supplements, Instaflex Advanced does not include Chondroitin and Glucosamine but rather relies on other scientifically-proven substances. This product contains a unique form of Boswellia extract labeled AprèsFlex, resveratrol, a polyphenol, UC-II Collagen, Black pepper extract, Hyaluronic acid, and, lastly, turmeric was added due to its fairly known anti-inflammatory properties. The product has been developed to provide numerous benefits to the user, such as a reduction in the discomfort that is often experienced when joints become painful, as well as significant improvements in flexibility within the joints that are affected. One particular aspect that makes Instaflex Advanced quite a popular product is the fact that the manufacturer claims the product will provide a significant improvement in the symptoms experienced by the user within the first seven days of usage. Instaflex Advanced has recently introduced a new trial program, where the user can gain access to a 14-day trial of the product to see if it works for them. Thereafter, the customer will be required to pay a monthly fee of $69.99 and a shipping fee of $4.99. The product is conveniently shipped automatically each month to the customer; thus avoiding running out of these supplements. Read more about Instaflex here. This product is unique in that it offers benefits not just to the joints but also surrounding muscles. Another thing that makes this product unique is that the product tablets are 80% smaller than other similar joint-supporting supplements. Larger supplements are often difficult to swallow, which can make a supplement inconvenient. With the smaller design in mind, users can easily take the supplement wherever they are to experience the numerous advantages that Osteo Bi-Flex is able to offer them. Osteo Bi-Flex is also suitable for those with gluten sensitivity and shellfish allergies. As far as the ingredients are concerned, the product contains glucosamine, type-II collagen, 5-LOXIN Advanced, and MSM. 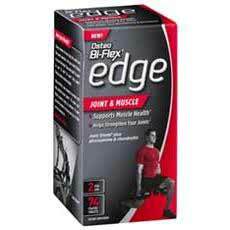 Osteo Bi-Flex has been developed in such a way to provide fast and effective relief of joint-related symptoms. According to the manufacturer of the product, if a user closely follows the dosage instructions provided on the packaging, they are expected to experience a significant reduction in pain, inflammation, and discomfort within the first seven days. After the first seven days, the symptoms will become even more reduced – long-term use will assist with improving flexibility and range-of-motion in the joints that are affected as well. Read more about Osteo Bi-Flex here. While Glucosamine is known to be one of the most popular joint-support ingredients found in nature, it most certainly does not work for everyone. Beneflex is a product that focuses on introducing the user’s body to the latest advancements in natural sciences. Instead of including Glucosamine in their formula, the manufacturer has taken a look at natural substances that can provide more effective results. Additionally, Beneflex does not utilize any type of filler, which means the entire capsule is filled with beneficial substances that will assist with improving joint-related symptoms – according to the manufacturer’s website, within as little as one week. The ingredients that make Beneflex so beneficial include a specialized UC-II Collagen, which has gone through numerous scientific trials and studies and was proven to effectively improve overall joint health. Other ingredients include ApresFlex, a specialized extract of the Boswellia Serrata plant, as well as Turmeric and Hyaluronic Acid. The product can be purchased at numerous locations, including Amazon.com, the world’s most popular online retailer. When looking at the product’s listing at various online locations, we could find mostly positive reviews from users who have used the product in the past to assist with reducing pain and inflammation in their joints, as well as for improving the overall flexibility of their joints. 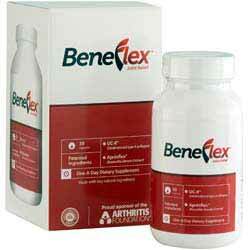 Read more about Beneflex here. OsteJuv’s main purpose is to improve joint lubrication as it contains high concentrations of hyaluronic acid. The manufacturers of OsteoJuv claim the product is capable of treating pain from different types of arthritis and works on all joints in the body. Besides improving joint lubrication, this product is said to reduce inflammation which is another contributing factor to pain and joint damage. With improvements in lubrication and a reduction in inflammation, the user is expected to experience improved comfort and range-of-motion in the joints that have been affected by these symptoms. 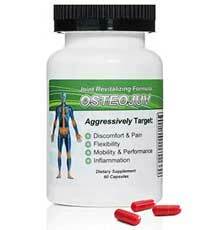 The primary ingredients found in Osteojuv include Hyaluronic Acid, Chondroitin, Glucosamine, Calcium and Gelatin. It should be noted that the combination of Chondroitin and Glucosamine has been proven to work more effectively than any one of these ingredients used separately. The product comes in the form of a dietary capsule and should be taken once per day – a total of two tablets need to be taken each morning. The product claims to provide effective results in a relatively short period of time, but continued usage will offer the user the most benefits. It should be noted that individuals who are allergic to shellfish should avoid using Osteojuv. Read more about OsteoJuv here. The manufacturers of Flexacil Ultra that this product contains the best-selling formula for joint pain relief available on the market today. It also contains ginger root and horsetail leaf extracts. This effect is due to the apparent ability of the horsetail plant to downregulate the levels of TNF-? which causes inflammation in RA. In addition to the horsetail leaf extracts and ginger root extracts, Flexacil Ultra also contains a combination of Glucosamine and Chondroitin – while these ingredients often fail to produce effective results when used alone, they have been proven to offer a significant improvement in joint-related symptoms when used together. One particular factor about Flexacil Ultra that sets it aside from many competing joint supplements is the fact that this product does not only aim to provide a relief in pain and inflammation symptoms experienced by the user. In addition to reducing the severity of these symptoms, the product also aims to assist the body in repairing the cartilage that has been damaged. When the cartilage is repaired, joint-related symptoms will gradually start to improve. The user will also start to experience improvements in flexibility, comfort, and range-of-motion within these joints. 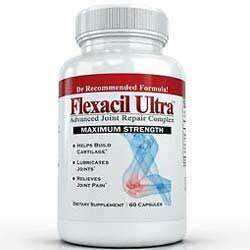 Read more about Flexacil Ultra here. 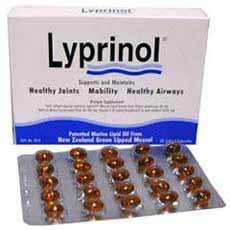 Another potent option for individuals suffering from joint pain that is accompanied by inflammation is Lyprinol. This product is unique and contains a specializes natural marine lipid extract. The extract consists of a very unique omega-3 fatty acids formulation, combined with lipid groups that are relatively rare. The product has gone through numerous scientific studies, as well as clinical trials, and has been proven to provide the user with effective anti-inflammatory effects. This particular supplement is useful for a variety of conditions that include inflammation as a symptom – this includes various types of arthritis, including osteoarthritis and rheumatoid arthritis. In addition to treating symptoms caused by arthritis and other joint-related issues, Lyprinol is also effective in treating many other conditions, such as asthma. The product comes in a capsule form. When starting to use this product, the user is advised to take up to four of these capsules on a daily basis for up to six weeks. Two of these capsules should be taken in the morning, and another two at night. It is advised to take Lyprinol supplements with a meal. After the first six weeks, the user is advised to lower their dose to a maximum of two capsules on a daily basis – this will be for maintenance. Read more about Lyprinol here. The manufacturers of Arthro 7 claim their product can help relieve joint discomfort, promote joint mobility, nourish the joint cartilage, and promote joint mobility. The product contains vitamin C, collagen, bromelain, CMO (cetyl myristoleate) which is a type of fatty acid, MSM, lipase, turmeric, Gelatin, silicon dioxide, titanium dioxide, and magnesium stearate. The manufacturer claims that more than eight million bottles of their Arthro-7 product have been sold to date and that the supplement has helped millions of people overcome common symptoms that affect their joints. Furthermore, the product does not contain any pharmaceutical drugs and is free of GMO, shellfish, and gluten. According to the manufacturer of Arthro-7, users typically start to experience results when they have used to produce for two weeks as a daily joint support supplement. 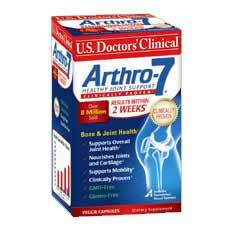 Arthro-7 is an affordable supplement that can be taken without experiencing any significant side-effects. Most users report that the supplement tends to work relatively quickly and that it does provide them with the benefits promoted by the manufacturer. A special offer can be utilized, which provides the customer a constant supply of the product to ensure they never run out of the supplement. By taking advantage of the special offer, the customer will pay $33.30 per one-month supply of the supplement. Read more about Arthro 7 here. 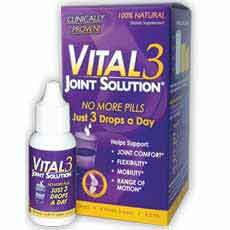 Vital 3 is different from other joint pain supplements because it comes in a drop dispenser. This product was also tested in clinical trials and was described as a good addition to other arthritis medication as explained on the product website. The collagen in Vital 3 is said to improve joint lubrication and cushioning which aids in its repair. This is an important feature to look for in joint support supplements as the breakdown of cartilage and joints is the primary cause of pain, as well as inflammation and other particular symptoms that people tend to experience. The fact that Vital 3 does not only focus on relieving the symptoms but also targets the cause of the symptoms, makes the product much more efficient than many of the other choices on the market. Vital 3 is not just a random product on the market. The supplement has scientific evidence to back up the claims made by the product’s manufacturer. In fact, 10 different clinical trials have been conducted on human subjects – and the results were quite impressive amongst all of the clinical trials that were conducted by the scientists behind this powerful formula. Read more about Vital 3 here. Flexitrinol is an innovative health supplement, specially designed to reduce joint pains, improve flexibility and promote overall joint health. It is made of powerful and high-quality ingredients that help to make your joint strength and reduce the pains. It also helps to prevent inflammation, which is the main cause of joint pain and also further damage to the affected joints. The product does not utilize any type of pharmaceutical drugs or harmful chemicals, but rather solely relies on nature in order to provide a potent formula that is virtually free of any potential side-effects. Ingredients found in Flexitrinol include Flaxseed oil, an Omega fatty acid complex (Omega 3, 6 and 9), MSM, vitamin C, Glucosamine HCL and Chondroitin Sulfate. Flexitrinol has been utilized by thousands of people, and the majority of these individuals have reported positive effects after taking the supplement daily over the course of a few weeks. The supplement is very affordable, with a special offer currently offering a one-month supply of Flexitrinol at the price of $39.99. It should also be noted that Flexitrinol has undergone several laboratory tests and clinical trials in order to provide evidence that the supplement is safe for long-term use and effective in producing the results it claims to provide. Read more about Flexitrinol here. Joint pain products contain ingredients that are believed to mainly reduce inflammation and repair joint structure. The supplements are meant to be taken orally, and the ingredients that enter the bloodstream are believed to improve collagen synthesis, inhibiting the synthesis of proteins that can cause joint cartilage destruction, and reduce inflammation and pain. Some supplements also improve joint lubrication by affecting the synovial fluid of the joints. This efficiency can depend greatly on the quality of the ingredients, their molecular weight, and their ability to enter the bloodstream. Most joint pain supplements you see on the market are derived from natural ingredients and are completely safe. 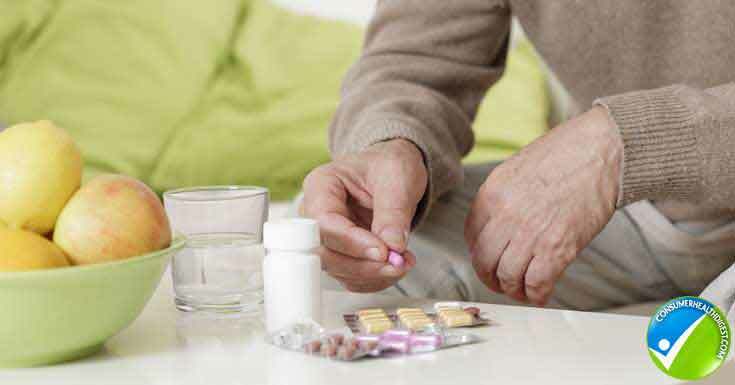 This also means you probably won’t have any side effects which is common with prescription treatments for arthritis. Talk to your doctor before taking these supplements especially if you are currently taking other medications. Another thing you need to consider before taking supplements is label transparency, i.e. that all ingredients are listed including binding ones. This is important especially if you have certain allergies and want to make sure you don’t have an allergic reaction to any of the ingredients in your joint pain supplement. The two most popular ingredients in joint pain supplements are glucosamine and chondroitin. Both ingredients are important constituents of healthy joint cartilage tissue. Their efficiency in repairing the joints is limited to laboratory studies. Other popular ingredients are the hyaluronic acid which is a part of the synovial fluid, diacerein, Avocado–soybean unsaponifiable (ASU), S-adenosylmethionine, Indian frankincense (Boswellia), capsaicin, turmeric, etc. Some of these ingredients are believed to help improve joint cartilage structure and speed up repair and others function as natural anti-inflammatories and pain relievers. Joint pain is a daily reality of the great number of arthritis sufferers. While medical experts are on the search for effective treatments of arthritis, patients rely on natural supplements to find at least some relief. While the effectiveness of dietary supplements in the treatment of arthritis pain is elusive, there are some studies speaking in favor of some of these supplements and ingredients. The best way to truly know if a supplement will work for you is to try it out for yourself. [*] Arthritis Foundation: "Tip-offs to Rip-offs, Common Therapies to Consider, Supplement Guide-Osteoarthritis, Supplements to Avoid." [*] Natural Standard: "The Authority on Integrative Medicine." [*] Robert Bonakdar, MD, director of pain management at Scripps Center for Integrative Medicine. [*] Harvard Health Publications: "Online Medical Dictionary."